Update: The motherboard allegedly supports Skylake-X architecture (up to 28-cores), not Cascade Lake-X. We had a chance to see Intel’s upcoming Skylake-X motherboard at a ‘chilling’ 8086K launch event earlier this year. At the time, the ROG Dominus motherboard was clearly a prototype. Things might have changed since then, but we don’t know if the motherboard is still called Dominus (update: actually we do, it’s called Dominus Extreme). 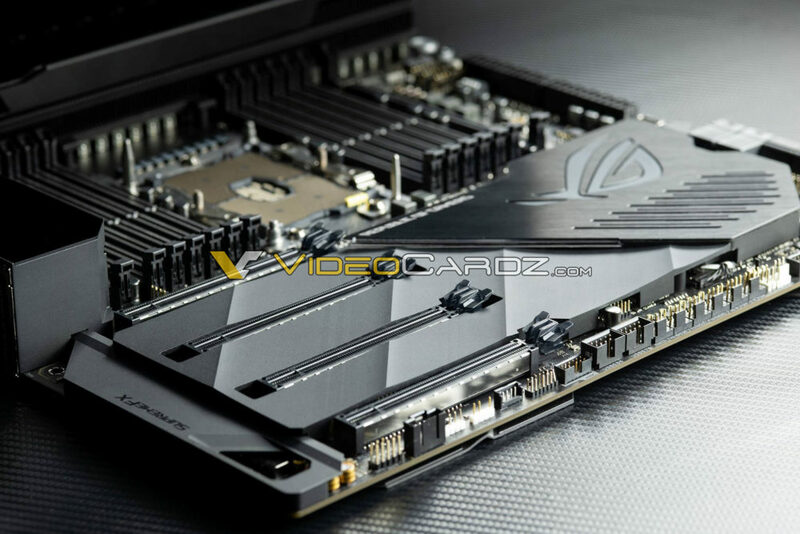 According to the picture we are sharing ahead of the ‘fall desktop launch’, ASUS is ready to showcase their next-gen HEDT motherboard for the LGA3647 socket and six-channel memory. The motherboard appears to be an E-ATX form factor, featuring four PCIe x16 slots and an unspecified number of M.2 slots (three? ), which are covered under a huge heatsink spanning across the full width of the motherboard. ASUS’ new HEDT motherboard, which is equipped with dual 24-pin power connectors, was designed for Skylake-X architecture, Intel’s long-awaited response to AMD Ryzen Threadripper.